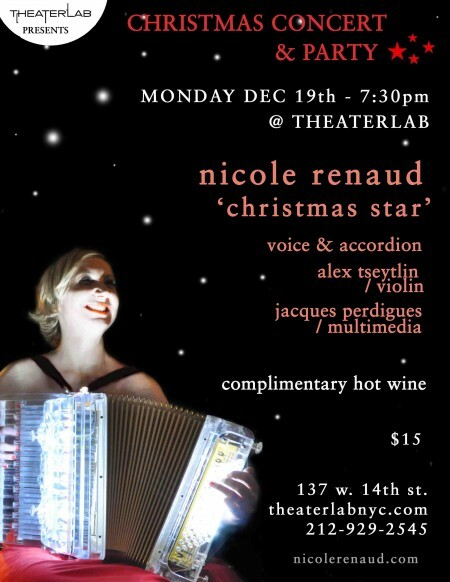 Monday, Dec. 19, 7:30 p.m.: New York, NY — Critically-acclaimed French soprano accordionist Nicole Renaud returns to Theaterlab (137 West 14th St.) with a special multimedia holiday concert, “Christmas Star,” featuring Alex Tseytlin on violin, and Jacques Pergigues choreographing the multimedia. Under a star-filled sky, Renaud presents an intimate musical journey of her favorite holiday music, from French and international carols to obscure winter songs. She’ll play a lincordian, a one-of-a-kind luminous transparent accordion, designed by British artist-engineer Paul Etienne Lincoln. For over a decade, Renaud has been a stalwart on the New York music circuit, winning raves from the New York Times, Time Out New York, and the New Yorker. Her song “Le Gris” (from her show last year, “Couleurs”) is featured in Idiots and Angels, the feature film by Bill Plympton, and was on the short list for the Academy Award nomination this year. Renaud will present a special preview of her show at South Brooklyn Post’s holiday party this Saturday, Dec. 3, at 8 p.m., at Invisible Dog Art Gallery, 51 Bergen Street, between Smith and Boerum Place. The show is free. 137 West 14th Street, between 6th and 7th Ave.